Still stuck? Check out DoubleJump's Rogue Galaxy Official Strategy Guide! Rogue Galaxy is a science-fiction RPG created by Level-5 and published by Sony Computer Entertainment for the PlayStation 2. After its release in North America, a Director's Cut version of the game was released in Japan, which included all the improvements and all the added features in the North American and European releases of the game. 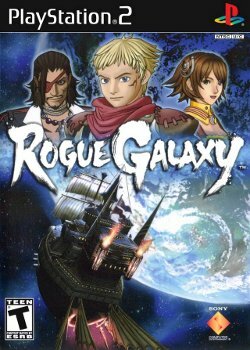 Rogue Galaxy tells the story of a young boy, known as Jaster Rogue, who was abandoned as a child and was raised by a priest on the planet Rosa. He dreams of becoming a space pirate and traveling through space. One day, after a giant monster attacks the town where he resides, his dream becomes a reality when he is invited to join the crew of the Dorgenark which he happily agrees to. The crew consists of, the captain of the Dogenark, Dorgengoa, Dorgengoa's daughter, Kisala, the mercenary, Zegram, the robot, Steve and Simon. The crew travel from planet to planet in search of a way to the legendary planet Eden, getting caught up in many different situations along the way. It is during these travels that the crew meet Lilika, an amazonian woman from the jungle planet Juraika, Jupis, an ex-researcher for Daytron from the plant Zerard, and Deego, an ex-Longuardian soldier from the plant Vedan. This page was last edited on 22 January 2016, at 02:44.